How is crowdfunding related to the development of NGOs in the future? 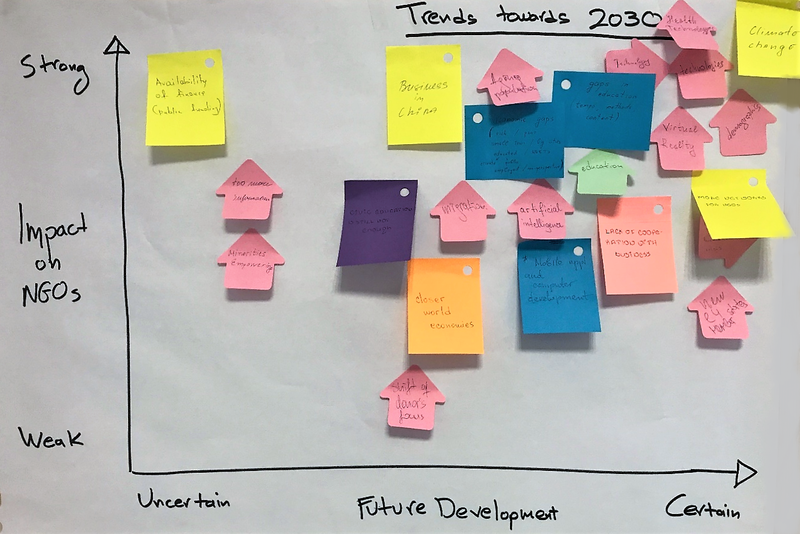 This was the topic of discussion in an ATSIV knowledge-exchange seminar in Sofia (September 2018), where the participants had the chance to think and talk about the future of funding and NGOs in the framework of the global Mega-trends. Mega-trends are usually viewed from the perspective of their effect either on individuals, or on corporations, but it is an interesting exercise to put the non-profit sector under the same scrutiny and examine the possible futures this way. For example, one conclusion of the participants in the seminar, was that while country economies are growing closer and just growing, NGOs will have more and more work filling in for gaps in healthcare, education and other services. The inclusion of more efficient processes, modern technologies and even AI open many new opportunities for better services for people, however the NGO workers envisioned even more hardships for governments in meeting the needs of their people. On the other hand, something very interesting to all participants was the future of funding for non-governmental organisations. As the mega-trends point out, the needs of the world are growing, however charitable giving – even though it was on the rise up until 2016 – has started declining since 2017, as the World Giving Index 2017 shows. This creates a significant uncertainty for NGOs – where will their funding come from? Crowdfunding is a growing means of collecting money – not only for start-ups and innovative business ideas, but also for causes and charitable projects, which people deem worthy. In fact, a 2018 study (where you can also find more interesting statistics on the topic of giving) shows that “16% of crowdfunders donate less money to NGOs, NPOs, & charities due to their financial support of crowdfunding campaigns”, which points to an important shift in the way people give. And seeing how tens of billions of dollars have so far been raised through crowdfunding campaigns, it is a worthwhile investment in time to look into this opportunity for your NGO as well. In your search for new knowledge on crowdfunding, you can try ATSIV’s serious game, which has a whole section dedicated to the topic! Stay tuned!